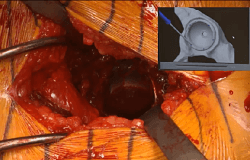 Adam M. Freedhand, MD, performs a robotic-assisted primary total hip arthroplasty by the direct anterior approach on a 45-year-old male patient. The patient is a muscular man who does motocross, and he is undergoing the procedure due to avascular necrosis with collapse of the femoral head. He has no leg length discrepancy despite significant abnormalities in his anatomy, according to Dr. Freedhand. Robotic technology is used during the procedure to assist with placement and alignment of the components. The procedure was performed at Memorial Hermann in Houston, Texas, and was broadcast live to attendees at ICJR’s Anterior Hip Course. Previous articleIs the Bicruciate Knee the Future of TKA?